I had three QSOs on day #133, I worked KA1ERL, Russell in Rhode Island on 20m JT65 and then switched to SSB and spoke to IR0LJ, Emilio. Later I changed to 40m where I had a nice long chat with Steve, M1ACB in Ipswich. Steve is a member of Camb-Hams and we had a talk about their recent trip to the Isle of Arran. Steve also posts on Twitter and it was quite an amusing situation – I heard him calling CQ and replied, gave my details and said “your callsign is really familiar, I’m sure I recognise it from somewhere”. His reply was “Yeah, hi Keith, it’s Steve”. How silly I felt! I met Steve recently at the Kempton Park rally so it was very nice to have a good long chat on the wireless. On day #134 I had two early contacts on 40m with DK5DC, Peter in Dortmund and GX6LD, a special event station for a fete near Huddersfield operated by Richard and then I slapped the wireless on 20m JT65 in the evening after watching the Eurovision Song Contest to work N0LWF, Lyle in Nebraska, KI4UMX, Henry in Georgia, WB0ZPW, Michael in Kansas, K4LRP, John in Florida and KW7E, Melvin in Arizona. It was quite fitting that the new DXCC I worked was 4K7Z in Azerbaijan because the winning entry in the Eurovision from last night was from Azerbaijan! At this point during the day I filled up my logbook! I’ve had this one for quite a few years. I looked back at my two previous logbooks, the first one I had lasted me a couple of years, the second one about five years and this third one was started over twenty years ago! It’s not a legal requirement for amateurs in the UK to keep a log any more but I still think it’s a good idea and almost all my contacts are written into my log (except perhaps some contest QSOs) as well as stored in computer based logging software. Once I’d started my new logbook I worked two more contest stations, RT6A and K1LZ before taking the family out for the afternoon. When I got home I had one more QSO, this was with IQ4FA, Dario, on 40m. This was a special event station for Castles on the air. This entry was posted in Amateur radio, Contesting, HF, JT65, New DXCC, QSO365, SSB, Twitter and tagged QSO365. Bookmark the permalink. Hello Keith, I think you’re one of the few that still keep a paper log and computer log. When I started HF in 2005 I kept a paper log and worked a contest. SInce I constantly worked dupes I decided to switch over to computer logs permanently. 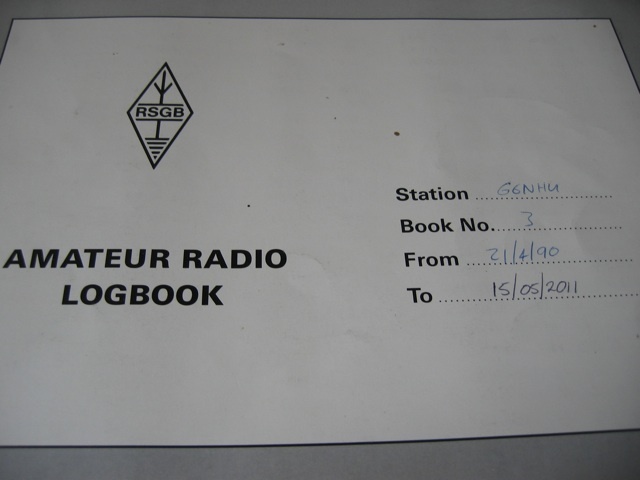 Never regret it since if I still had a paper one I would not be able to manage 12000 QSOs. But I still keep my written logs just for nostalgia, but never had one that was started 20 years ago 😉 73 Bas. I’m not so sure about that, Bas. I asked on a mailing list about getting a replacement logbook of exactly the same type and I managed to get hold of one. Quite a few people commented on log keeping and it seems that it’s still pretty common to keep both a paper log and a computer one. I can still look back through my logs from when I was first licenced. I wonder how many computer logs will still be intact in nearly thirty years time. Not many, I’d guess. Paper lasts far longer than electronic bits on a magnetic or optical disk. I think it’s a shame that quite a lot of people don’t even keep logs any more. With the QSO365 project, I’m sending out QSL cards to almost everyone I work (barring contests) and I reckon there will be some people will receive my card but won’t even have a record of the QSO to check it against.